Scrub-a-dub-dub Get that Pet in the tub! Your pet enjoys a luxurious spa treatment including plenty of lather, as we massage all over the body with our relaxing spa treatment. Only natural shampoos and rinses are used. We do not use colognes. 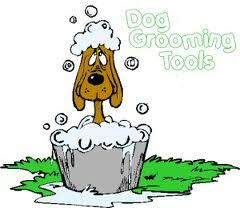 Long haired dogs also enjoy a conditioning cream rinse to help soften the coat at no extra charge. After bath, a blow dry, nail trim, and sanitary trim as necessary. A groom is anything more than a bath that includes the use of scissors or clippers. We do complete clip downs. Clip/Shave Downs are the summer clips that some dogs only get once a year. On large dogs, this clip can take a considerable amount of time. which is why it is easier on the dog to schedule several of these clips each year. At times due to the dogs age or physical condition, you may be required to allow an overnight board to complete the Clip Down. All Clip Downs include bath, brush and nails.